This feta cheese pie is delicious. It's made with sfoliata, a Greek puff pastry, and although it may not deliver the light-as-air flakiness of thin phyllo dough sheets, it's a great alternative when your time is at a premium. It can also be made with "country phyllo" and regular thin phyllo sheets. In a bowl, use a fork to crumble the feta very finely. In another bowl, whisk together 3 eggs and the milk until well blended and frothy. Add the milk mixture, salt, and pepper to the cheese and combine thoroughly. If the mixture is too thick (it should be "slushy"), add a bit more milk. Open the sfoliata package and carefully unroll the sheets. Puff pastry generally contains 2 sheets; "Country phyllo" may contain anywhere from 2 to 8 sheets; thin pastry phyllo may contain 20-22 sheets. Lightly butter a baking pan and lay half the sheets on the bottom, lightly buttering each one. Pour in the filling evenly and cover with the remaining phyllo, brushing each lightly with butter. 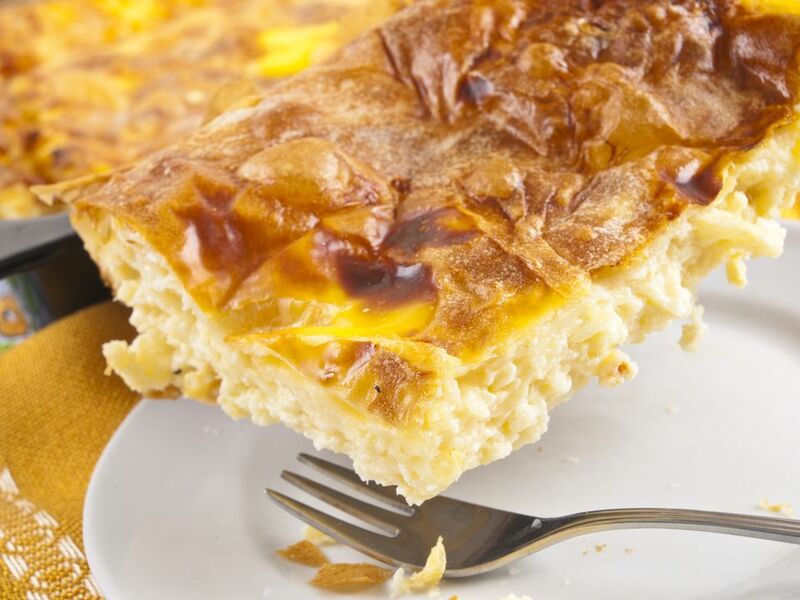 Brush the top of the pastry with beaten egg or milk. Score the dough into 12 pieces (or as preferred), and bake at 350F (180C) for 30 minutes or until golden brown and flaky. Remove, let cool a few minutes, and serve.